After losing the series to Southern Arkansas State earlier this week on the road the Reddies softball team returned home to Dee White field for a double header two day series against Southwestern Oklahoma State. They played against a team who has struggled so far to find its footing in the GAC the Reddies and looked to boost its standing while putting on a show for thehometown fans. Game one of the double header opened up as an absolute home run derby for the Reddies. In a 9-1 victory over the Lady Bulldogs hitting home runs in the first three innings, Sydney Bonner won her tenth straight game of the year while manning the circle. Southwestern Oklahoma actually started the game off on the right note when they scored their first run off of three hits in the top of the first before the Reddies responded with bases loaded single in the bottom of the same inning with bases loaded to scored two runs. In the next inning, Lindsey Williams singled to start things off while Maddie Green launched one out of the park to put Henderson up to a 4-1 lead. The Reddies saw another home run scored in the next inning when Christina camp drilled one to put the Reddies up to a 5-1 lead. With the bats still hot going into the fourth, Kailey Reese gave the Reddies their third home run of the when she knocked a line drive over the right wall. With Lindsey Williams already on base, the Reddies saw their lead grow to 7-1. Not done just yet after Bethany Allen drew a walk pinch hitter Selena Mendoza delivered a line drive base hit on a full count. second base on her on the second hit of the day. This put the mercy rule in to effect and saw the final score at 9-1. The second game of Saturday’s double header saw a seven run fifth inning blow the Lady Bulldogs out of the water, or park, to complete the sweep of the first of the weekend’s doubles headers. Mallory brewer got her fourth win in the circle with this win and allowed just one run on six hits in the five innings it took to finish up in the Saturday affair. The Reddies just seemed to be in full control of every aspect of each game while the Southwestern displayed the same confusion and lack of footing they showed all season. The Reddies came into Sunday’s double header expecting more of the same coming into the game with under the assumption that they could display the same dominance they had shown yesterday. Nothing seemed to click, however, as they Reddies played down right sloppy throughout both of Sunday’s games. Numerous errors and lapses of judgment in the games more critical and winnable moments led to the Reddies losing both of Sunday’s games. The first game had the most shocking outcome as the Reddies saw the final score end with them having only 1 run scored the entire outing. 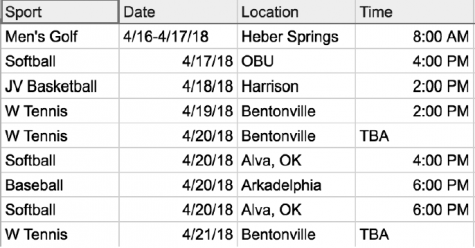 On the other end of the box score, Southwestern Oklahoma had 8 runs on 12 hits scoring in all but 3 of the seven innings played. The next game saw a more gridlock affair came down to the wire that could have easily gone either way in the bottom of the seventh inning. With the score 3 -2, the Reddies needed two runs to see themselves coming out of this with a win but were unable to respond to an error that had happened at the top of the seventh half that allowed them to go up 3-2. With their record now standing at 18-15 in conference play the Reddies will hit the road to play three straight road games, the first of which will have them traveling across the ravine to face off against OBU. The first of the double header starting off at 4 p.m. and then they are traveling to Alva, Okla. to face off against Northwestern Oklahoma State University. The schedule for the upcoming games for all kinds of sports is below.